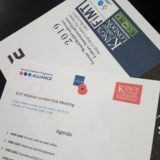 SCiP Alliance researchers disseminated their work at the annual conference of the Society for Research into Higher Education (SRHE) in December 2018. Principal investigator Dr Judith McCullouch and research development officer Michael Hall gave a paper entitled “Thriving lives for military service children: improving progression to HE”. This paper explored the major emerging themes from SCiP’s research and emphasised the impact of the Alliance so far. Dr Matthew Thorne gave a paper examining the attainment of Service children at level 3 (post-16) and exploring its connection with progression to higher education. Held at the Celtic Manor Resort, Newport, the SRHE International Conference on Research into Higher Education brought together a global community of researchers from a wide range of disciplines. The conference addressed the relation between inclusion and excellence in a changing environment for higher education. It is one of Europe’s largest conferences dedicated to research into higher education.